Under the ownership of Norm Fox and through the work of the staff led by his son A.J., the historic Salem, Ohio track has been transformed into a true destination with racers coming from all over North America to visit the facility, which recently signed a multi-year sanctioning renewal with the International Hot Rod Association (IHRA). "It blows my mind when I see racers from Canada and as far as Florida and California stopping here," A.J. Fox said. "A lot of these guys hear it's the nicest grassroots race track. It's been around since 1957 and I think the word of mouth and having a good program brings people to check it out." 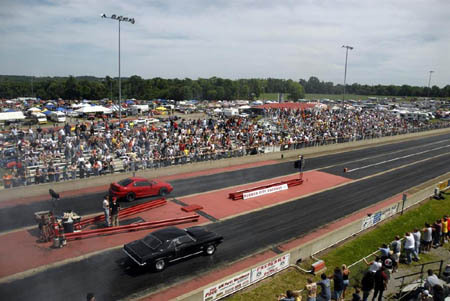 Over the last eight years, there has been a massive amount of work done at the 1/4-mile drag strip and the rest of the property. One reason for the success is it's a constant goal to improve the facility. "We repaved the shutdown and return roads all the way to the staging lanes up to the water box," Fox said. "When we initially purchased the track one of the first things we did was to install the concrete walls. We re-did the track surface in the first couple of years and we've made improvements every year since from concession stands to the souvenir building. More recently, the restrooms were redone and a big thing last year was getting showers put in. We focus on improving every year." For the bracket racers, Quaker City Motorsports has found a good fit with the IHRA Summit SuperSeries and Summit Team Finals programs. Quaker City driver Chris Black was the 2017 IHRA Summit SuperSeries Mod World Champion and he repeated as track champion last season. Other track champions included Greg Myers (Top) and Kyle Hughes (Junior). "The top 10 in each class are habitual racers here and a lot of that is the fact they know there is a shot to go to the bracket finals and then the World Finals," Fox said. "It gets us more people racing and more people committed to the sport with all the benefits with the program." There are plenty of special events including the Nostalgia Classic in May, the QMCP Summer Nationals in June and the Night of Fire in July. Nothing is quite like the Great Pumpkin Race in October. It is a massive celebration for the racers and their families with costume contests, trailer-decorating contest and thousands of trick-or-treaters. It attracts over 700 entries annually at the over 100-acre facility. "Every year this place is packed and it's somewhere that people love to come to," Fox said. "Everyone comes and has a good time. It's the most special race we have. You have thousands of kids going trick-or-treating, going trailer to trailer and getting candy. It's really something to see." Click here to visit Quaker City Motorsports Park's website. For a list of IHRA member track click here.